Doreen Virtue is the best-selling author of Healing with the Angels, Messages from Your Angels and over 20 books and oracle card decks about Angels, Chakras, Crystal Children, Indigo Children, and more. Many people know Doreen as the spokesperson for all things “angel,” but most do not know how she dramatically came to this role: On July 15, 1995, Doreen ignored the guidance of an angel who clearly warned her that her car was going to be stolen. Later that day, two armed men physically accosted her in a parking lot. Doreen inwardly heard a loud, male voice that told her to scream with all her might. As a result, her life was saved, and from that moment, Doreen began listening to and actively working with her angels. In her new book, Saved by an Angel, Doreen shares stories about ordinary people who have experienced angelic interventions. She also provides wonderfully detailed instructions for anyone who would like to work with the angels in their healing practice. Randy Peyser: There is a story in “Saved by an Angel” about a woman who decided to walk on a different trail than where she’d planned to walk. Another woman is then attacked on the original trail. The woman who was saved felt protected by her angel. So, why is it that some people are saved from danger by an angel, while others aren’t protected? Do the angels pick and choose? Doreen Virtue: It can appear that way. And unfortunately, it can be the justification for people who have agendas to say things like, “If you go to this church you’ll be saved.” But most likely, the woman who was attacked was also warned, but didn’t listen. My experience is that everyone is warned about everything that could potentially harm them — whether that involves a wrong trail, a relationship, or something to do with your baby, etc. The question is: Do we listen? Randy: What does that listening look like? Doreen: For most people, it’s through their feelings. We call it gut feelings, intuition or being empathic. A lot of people discount their feelings, but when they practice listening, they get to know their feelings are sacred and connected to the Source. The Universe will talk to you through your feelings, including your physical feelings. For example, if you meet someone who doesn’t have integrity, your muscles might tighten or you’ll feel a sick feeling in your stomach. You can also experience emotional feelings like fear or excitement. Randy: Do angels have feelings? Doreen: Their feeling is one-hundred percent love. True angels have no ego so they don’t have fear-based emotions. They have many ranges of love. They show us they’re proud of us, cheer us on, and motivate us. Every shade of love — from parental love to friend love — you see from the angels, but you don’t see any of the ego-based feelings. Randy: What do the angels want for us? Doreen: Angels are messengers of God or Source. Angels are here to help us bring about peace on earth. They want to help you to be at peace. Angels do recognize our free-will, so they won’t push themselves on us, but will offer guidance. The key word is to listen. Most people just want to ask the angels questions, or talk about their worries or fears, or complain. But very few people want to stop and listen to the answers to their questions, which is the guidance they are receiving. Randy: How do you know when you’re receiving angelic guidance or if it’s just coming from your own mind? Doreen: When an angel is talking to you, it’s always from a place of love, including any feelings associated with love, such as warmth, a feeling of safety, or a feeling that you are sure about something even though it might intimidate you. Angels do stretch us past our comfort zones, for sure, but notice that feeling of surety. If your guidance is ego-based, there will be a feeling like you are getting away with something. Or there will be a cold, prickly feeling, a guilty feeling, or another fear-based feeling. With practice you can discern between the two, but it takes time. Have patience. Randy: How did you open up to the angels? Doreen: It’s been since childhood. I was born in 1958, which was the era when it was a bad sign if your kid talked to an invisible friend. But I had spiritually-based parents who gave me the space to talk to my angelic friends. Randy: How do you perceive the angels? Doreen: I actually see them. I don’t see them as solid as I would see you, but I see them very clearly in my mind’s eye. I am very clairvoyant. There are different ways to discern angels. The number one way is through feelings. You may feel air pressure changes, or real strong gut feelings to take action or feel warmth. You might see spark-ling lights that have no physical origin or signs, like feathers or coins that appear from out of nowhere. You could also see repetitive number sequences, like 111 or 444 everywhere you go. Randy: One day, many years ago, I stood in my living room and shouted: “I call on my Collections Angels to go collect anything that is owed to me from anybody in the universe! Later that day, a woman who had owed me money for over two years paid me. I had never heard of Collections Angels — I made it up — but it worked. Doreen: There are angels for everything. We all have steady Guardian Angels who are with us our whole lives. They are only our angels. Then there are other angels who specialize in things, like helping you with your finances, romance, health, career, or moving to a new house, etc. These angels can come and go as those issues come into your life. There are also Archangels like Michael, Raphael, Gabriel and Uriel. There’s hundreds of these Archangels. They are supervisors of Guardian Angels. They are specialists as well, and they are very powerful. They are non-denominational and unlimited, so they can be with every person simultaneously and have a unique experience with each person. I think that the more angelic friends the better. They are trustworthy, egoless beings. I say to call on all of them. You’re not going to take them away from anyone else. They want to help you do whatever it takes to be at peace. It’s also okay to ask for help with little things, like finding a parking place or finding the right gift for a friend’s birthday. The things that seem trivial to you are the things that bring about peace when the angels help you. Randy: Do the angels have rules? Doreen: The only rule they have is abiding by our freewill choices. They will do whatever it takes to bring us peace. Let’s say you ask to work at Company A, but the angels tell you that you will be more on your purpose and be happier and more at peace if you work at Company B. They may steer you to Company B, but they will still be fulfilling your wish or your prayer to get you a great job. Randy: When people do intentions they often want their answer to look a specific way or come through a specific form, when actually, they are sabotaging their Highest Good by doing so. The Universe is beyond what our limited human mind can see. I always preface my intentions by saying, “This or something better, God,” because I know that our human standards are much lower than God’s standards. Don’t demand that it be this job, house, or romantic partner. You can say, “I want a wonderful job, house, or partner,” then let the Universe do its magic and figure out the best solution for you. The other part of this is to not worry about “how” your prayer will be answered. The “how” isn’t up to you; it’s up to the Divine Infinite Mind. Just surrender the prayer. Let it go, then follow the guidance that comes to you that asks you to take action. Randy: Right now, many people feel like the challenges in their lives are intensifying. What can they do? Doreen: It’s a huge time of change. The first thing to do is to let go of the rock that you’re clinging to by your fingernails and allow yourself to flow and change. If you try to keep the status quo or go the old way, you’re going to be thrashed by the flowing river around you. Just go with the flow. In other words, surrender any feelings to change, or to any doors that open to you. Don’t try to stay static right now; it won’t work. Randy: I’ve always said that letting go isn’t hard; it’s the holding on that is. Randy: I’d love to get your thoughts about death. One day I sat on a bus and watched my parents as they talked in a parking lot. They couldn’t see me because the bus windows were darkened. I wondered if that was what death was like — that those on the other side of the veil might see us, but we can’t see them. Doreen: That’s a good analogy. They don’t really see us physically; they see the energy of everything. They see the energy of our thoughts and our feelings. The angels probably showed you that for that reason. Randy: Are synchronicities angelic setups? Doreen: I think the angels are part of it. I think synchronicities are really more about you paying attention to what always is. The universe is in perfect and Divine order. When you notice it, it means you are in sync with the universe. Again, it goes back to really listening. Listening, listening, listening. I can’t emphasize that enough. It’s such a huge message the angels have for all of us right now. Stop talking and be quiet and listen to the answers and the guidance they are giving you. That would include signs and synchronicities. Randy: Do you use affirmations? When I made them, I felt like I was lying. I would wince when I heard my own voice because I had very low self-esteem. But I made myself listen to those affirmations three times a day. Within a month, I started to believe them, and quickly, they started to become true. State what you dream of in the here and now as if it’s true, and say it over and over again. Randy: You’ve achieved great success as an author. What’s next? Doreen: More of the same. I’m on my purpose, which is why I have the success. When you’re on your purpose you never want it to end. Writing, teaching and doing oracle cards are my complete and utter joy. In February, I have a deck of Romance Angels Oracle Cards coming out in time for Valentine’s Day. It’s been a dream of mine to do a relationships deck for 20 years. It took me all this time before I could do the deck because I had to understand the basis of healthy relationships before I could channel it. Randy: During my first encounter with the angels, I felt lit up with light. But I also felt like I was paralyzed. I’ve known others who have experienced something similar. Doreen: It’s not so much that you were paralyzed as time stands still. The angels took you to a place of timelessness. It was like a mini Near-Death experience. That increased your psychic abilities, too. Randy: What do you think of orbs? Are they some form of angel? Doreen: Definitely. Angels want everybody to know about their presence, so they’re making their presence known all the time. They’ve been showing up on digital photography. Occasionally some orbs are dust on a camera lens, but a lot of them are beyond explanation. Small colored orbs seen outdoors are fairies or nature angels. The white orbs seen indoors are Guardian Angels. The angels are not shy; many orb pictures actually have the form of wings. Randy: Is it easier to access angels during the holiday season? Doreen: You can access them any time. Whenever there’s more need for them, there are more angels on this earth. Randy: “Saved by an Angel” is a superb manual for anyone who wants to become an Angel Practitioner. Can you give some guidance for people who want to incorporate an angelic aspect into their healing practice? Doreen: The first thing is that you don’t need to talk to the angels out loud when you are doing angel work. For example, if you are a body worker, you can silently ask the angels for guidance while you are doing your healing work. Many of my students are medical professionals who work with the angels on a very quiet basis. Randy: How often can we call on the angels? Doreen: Before you begin anything — whether it’s a healing session, driving across town, or calling a friend — I say, call the angels for help with everything. Take a moment, close your eyes if you can, breathe, and ask the angels to help you. For instance, before I call the airlines to make a reservation I ask the angels, “Please get me a wonderful representative, who is competent, quick, understands easily, and who helps me out. Always, I get the nicest people who do magic with the tickets. Anyone can do this. I’m not special. 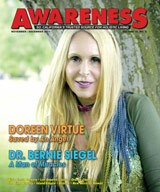 It’s not about Doreen Virtue. It’s about God and the angels, and they are available to each of us. Everyone has angels with them at all times just like everyone has a heart, and lungs, and a brain. They are with you and they want to help you, so why not utilize this gift that God has given you? Randy: All we have to do is ask. Doreen: Yes, and it doesn’t matter how you ask. You can’t do it wrong. What matters is that you do ask.